Think scoring tickets to the hottest musical on broadway is impossible? Let Nichiha help you redefine possible with a chance to win two tickets to Hamilton: An American Musical on Friday, June 22! Fill out the form below and be entered in the giveaway. Attending the AIA Conference on Architecture 2018? Visit booth #745 at the Architecture Expo to increase your odds of winning and see what’s new with Nichiha. Enter online and at the booth! , I also agree to receive email communication and special offers from Nichiha USA. 1. PROMOTION DESCRIPTION: The Nichiha Broadway Tickets Sweepstakes (“Sweepstakes”) begins on May 31, 2018 at 5:00 AM EST and ends on June 22, 2018 at 4:00 PM EST (the “Promotion Period”). The sponsor of this Sweepstakes is Nichiha USA, Inc. (“Sponsor”). By participating in the Sweepstakes, each entrant unconditionally accepts and agrees to comply with and abide by these Official Rules and the decisions of Sponsor, which shall be final and binding in all respects. Sponsor is responsible for the collection and processing of entries and the overall administration of the Sweepstakes. Entrants shall look solely to Sponsor with any questions, comments or problems related to the Sweepstakes. Sponsor may be reached by email at info@nichiha.com during the Promotion Period. 2. ELIGIBILITY: (a) The Sweepstakes is open to all registrants attending the 2018 American Institute of Architects (“AIA”) Conference on Architecture held in New York City, N.Y. on June 21 to June 23, 2018 (the “AIA Conference”), who are 21 years of age or older and legal residents of the United States. The Sweepstakes is not open to the general public. No consideration, purchase, or payment of any kind to or from Sponsor is required to enter. The Sweepstakes is not affiliated with, endorsed by or sponsored by the American Institute of Architects, or the AIA Conference, or the Broadway production of Hamilton: An American Musical. Sponsor receives no consideration from any other party for offering this Sweepstakes. (b) Sponsor, and its respective parents, subsidiaries, affiliates, distributors, retailers, sales representatives, advertising and promotion agencies and each of their respective officers, directors, managers and employees (the “Promotion Entities”), are ineligible to enter the Sweepstakes or win the prize. Household Members and Immediate Family Members of such individuals are also not eligible to enter or win. “Household Members” shall mean those people who share the same residence at least three months a year. “Immediate Family Members” shall mean parents, step-parents, legal guardians, children, step-children, siblings, step-siblings, or spouses. This Sweepstakes is subject to all applicable federal, state and local laws and regulations and is void where prohibited or restricted by law. 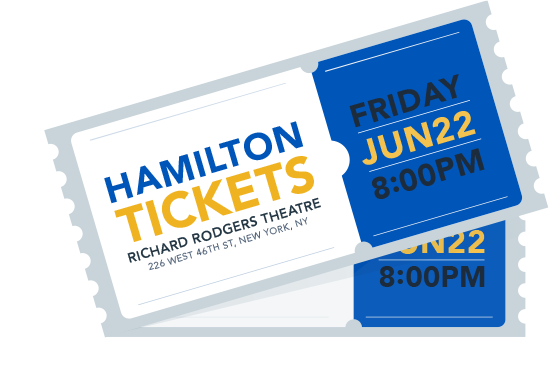 The Prize: One (1) winner will receive two (2) tickets to Hamilton: An American Musical in New York City, N.Y., for the performance at 8:00 PM EST on June 22, 2018. The approximate retail value or “ARV” of a ticket is $500 and the total ARV for two tickets is $1,000. Only one winner will be selected from all eligible entries properly submitted during the Promotion Period and awarded the Prize. No prize substitution or cash equivalent is permitted except in the sole discretion and with the prior written consent of Sponsor. Sponsor reserves the right in its sole and absolute discretion to award a substitute prize of equal or greater value if the prize described in these Official Rules is unavailable or cannot be awarded, in whole or in part, for any reason. The ARV of the prize represents Sponsor’s good faith determination. That determination is final and binding and cannot be appealed. If the actual value of the prize turns out to be less than the stated ARV, the difference will not be awarded in cash or otherwise. Sponsor makes no representation or warranty concerning the Prize. Restrictions, conditions, and limitations may apply. Sponsor will not replace any lost or stolen prize tickets. Failure to comply with the Official Rules will result in forfeiture of the Prize. The Prize is subject to, and the winner is solely responsible for, all applicable local, state and federal taxes. A 1099 tax form will be issued to a winner in connection with the Prize. Any additional expenses incidental to the use of the Prize are the sole responsibility of the winner. 4. HOW TO ENTER: Enter the Sweepstakes during the Promotion Period by visiting the Sponsor’s Booth at the AIA Conference and completing and submitting an entry form with all required information. Entrants are allowed one entry per person during the Promotion Period at the AIA Conference. Incomplete entries or entries without a valid email address or phone number capable of receiving the winner notification or a physical mailing address for Prize delivery by courier service will be disqualified. Multiple entries submitted by individual entrants by any means will be disqualified. Any attempt by an entrant to obtain multiple entries by using multiple/different email addresses, identities, registrations or any other methods will void entrant’s entries and the entrant may be disqualified. Final eligibility for the award of any prize is subject to eligibility verification as set forth below. All entries must be posted by the end of the Promotion Period in order to participate. Sponsor’s database clock will be the official timekeeper for all aspects of this Sweepstakes. 5. WINNER SELECTION: The Winner of the Sweepstakes will be selected in a random drawing from among all eligible entries received during the Promotion Period. The random drawing will be conducted approximately 30 minutes after the Promotion Period expires according to Sponsor’s database clock, by Sponsor or its designated representatives, whose decisions are final and binding. Winning the Prize is subject to the Winner Notification paragraph conditions set forth below. Odds of winning will vary depending on the number of eligible entries received. 6. WINNER NOTIFICATION, ACCEPTANCE AND PRIZE DELIVERY: Winner will be notified by phone, email or text at the phone number(s) or email address provided in the entry form within approximately one (1) hour after the random drawing. A potential Winner must provide notice of acceptance of the Prize by response to the Sponsor by email or text within one-and-ahalf (1.5) hours of notification. Sponsor is not responsible for any delay or failure of a potential Winner to receive notification for any reason, including inactive or invalid email account(s) or phone number(s), a potential Winner’s failure to adequately monitor any email account or phone number, or any technical difficulties associated therewith. Any winner notification not responded to, rejected or returned as undeliverable, or not timely accepted, may result in Prize forfeiture. The winner can accept delivery of the Prize at the AIA Conference if present at that time; otherwise, the Prize will be delivered by a courier service chosen by Sponsor. In the event of a winner’s disqualification, the Sponsor, in its sole discretion, may choose to randomly redraw and select an alternative winner from all remaining eligible entries until a winner is selected. The potential prize winner may be required to provide proper identification and sign and return an affidavit of eligibility and release of liability, and a publicity release where not prohibited (collectively “the Prize Claim Documents”). No substitution or cash equivalent of the Prize is permitted except in the sole discretion and with the written consent of Sponsor. 7. PRIVACY: By entering the Sweepstakes, you grant Sponsor permission to use your email address and any other personally identifiable information for the purpose of administration and prize fulfillment, including use in a publicly available winner list. By entering the Sweepstakes, entrants agree to the use of entrant’s information for Sponsor’s marketing purposes, subject to an entrant’s subsequent right to opt out of and/or unsubscribed from receiving any marketing communications from Sponsor. Sponsor will not sell or share your information to or with third parties. 8. LIMITATION OF LIABILITY: Sponsor assumes no responsibility or liability for (a) any incorrect or inaccurate entry information, or for any faulty or failed electronic data transmissions; (b) any unauthorized access to, or theft, destruction or alteration of entries at any point in the operation of this Sweepstakes; (c) any technical malfunction, failure, error, omission, interruption, deletion, defect, delay in operation or email or telephone communicatio s line failure, regardless of cause, with regard to any equipment, systems, networks, lines, satellites, servers, camera, computers or providers utilized in any aspect of the operation of the Sweepstakes; (d) inaccessibility or unavailability of any network or wireless service, the Internet or any combination thereof; (e) suspended or discontinued Internet, wireless or landline phone service; or (f) any injury or damage to entrant’s or to any other person’s computer or mobile device which may be related to or resulting from any attempt to participate in the Sweepstakes. If, for any reason, the Sweepstakes is not capable of running as planned for reasons which may include, without limitation, infection by computer virus, tampering, unauthorized intervention, fraud, technical failures, legal issues or any other causes which may corrupt or affect the administration, security, fairness, integrity or proper conduct of this Sweepstakes, the Sponsor reserves the right in its sole discretion amend or modify the Official Rules or to cancel, terminate, modify, rescind or suspend the Sweepstakes in whole or in part. In such event, Sponsor shall immediately suspend all drawings and the Prize award, and Sponsor reserves the right, in its sole discretion, to award the Prize (up to the total ARV as set forth in these Official Rules) in a manner deemed fair and equitable by Sponsor. Sponsor and Released Parties shall not have any further liability to any entrant in connection with the Sweepstakes. 9. ARBITRATION ONLY; NO CLASS ARBITRATION; WAIVER OF JURY TRIAL; CHOICE OF LAW. (a) As a condition of participating in this Sweepstakes, each entrant agrees that (1) any and all disputes, claims, and causes of action arising out of or connected with this Sweepstakes, or the Prize obtained through the Sweepstakes, shall be resolved individually, without resort to any form of class action, and exclusively by arbitration under the Commercial Arbitration Rules of the American Arbitration Association as then in existence. This means an entrant will not have the right to litigate a claim in court or have a jury trial. Further, an entrant will not have the right to participate in a representative capacity or as a member of any class of claimants pertaining to any dispute, claim or cause of action arbitrated hereunder. Arbitration will take place in Atlanta, Georgia, at a location selected by Sponsor and the Arbitrator’s decision shall be final; (2) any and all resulting claims, judgments and awards shall be limited to actual out-of-pocket costs incurred, including costs associated with participating in this Sweepstakes, but in no event attorneys' fees; and (3) under no circumstances will entrant be permitted to seek recovery for, and entrant hereby waives all rights to claim, punitive, exemplary, incidental and consequential damages and any other damages, other than for actual out-of-pocket expense , and waives any and all rights to have damages multiplied or otherwise increased. (b) All issues and questions concerning the construction, validity, interpretation and enforceability of these Official Rules, or the rights and obligations of an entrant and the Sponsor in connection with the Sweepstakes, shall be governed by, and construed in accordance with, the laws of the State of Georgia, without giving effect to any choice of law or conflict of law rules or provisions (whether of the State of Georgia, or any other jurisdiction) that would cause the application of the laws of any jurisdiction other than the State of Georgia. 10. WINNER LIST/OFFICIAL RULES: To obtain a copy of the Winner List or a copy of these Official Rules, send your request along with a stamped, self-addressed envelope to Nichiha USA, Inc.—SWEEPSTAKES at 6465 E. Johns Crossing, Suite 250, Johns Creek, GA 30097. Requests for the names of the winner must be received no later than July 1, 2018 after the Promotion Period has ended.